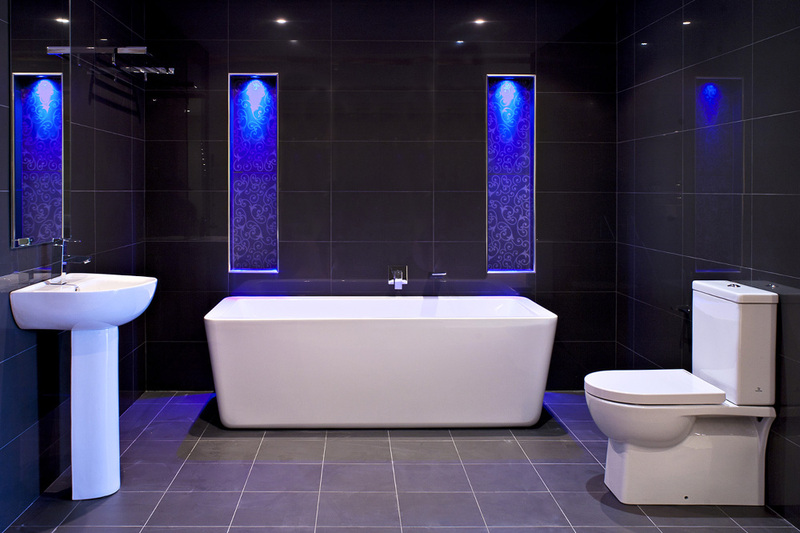 Erina | Custom Bathrooms | Central Coast bathroom renovations – Modern bathroom ideas. This luxurious bathroom at our Erina showroom is an excellent example of the elegance you can achieve in your own Custom Bathroom. Breaking away from the standard white bathroom, this sophisticated space is sure to impress. The use of mosaic tiles and blue LED lighting in the niches adds a touch of class, whilst also providing stylish storage and lighting solutions. The stunning whites of the freestanding bath and other items of bathroom furniture contrast beautifully with the black wall and floor tiles, creating a truly opulent space.